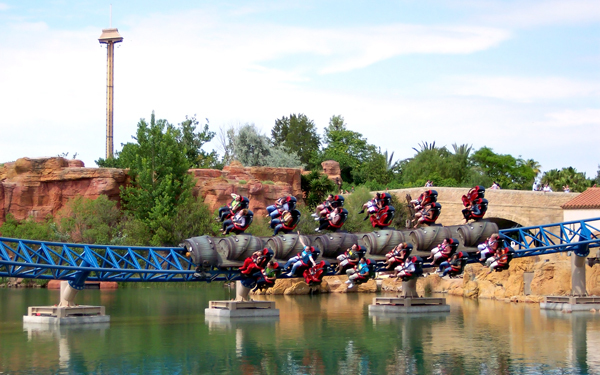 Gardaland and B&M have teamed up to announce a one of a kind attraction, called X-Raptor. X-Raptor is Bolliger and Mabillard’s answer to Intamin’s Wing Rider. The ride will put riders over the edge of the track suspending them over mid air. Riders will be trying escape form a giant beast terrorizing the cities. Featuring a 2,500+ foot track, a climb just under 100 feet, 90 degree turns, and 2 inversions. X-Raptor, Announced for Gardaland 2011, introduces a new style of coaster for Bolliger and Mabillard. This is the first new style of ride since B&M introduced their flying coaster back in 2002 with Air and Superman’s Ultimate Flight. The company appears to be pushing the envelope with this new coaster. With a fairly a short maximum height, indicating that it may feature a launch. This attraction does seem to share some similarities with Furius Baco and Port Aventura in Spain. 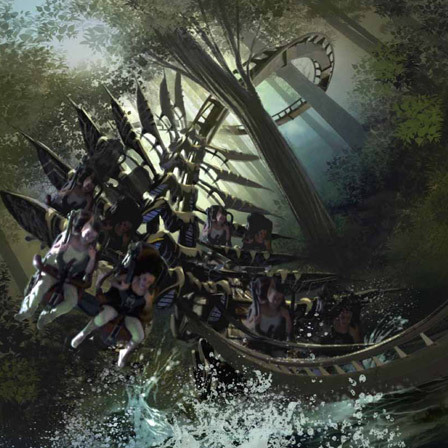 Both attractions feature low to the ground elements, barrel roll inveresions, and Wing Rider style trains. It will be interesting to see how this plays out and what will make this Bolliger and Mabillard’s creation differentiate from Intamin’s Wing Rider. Holy Crap! This sounds amazing, I really can’t wait to see a POV.